Aptitude or Attitude~ What makes a Star Performer? I’ve been thinking a great deal of late about what makes the difference between a good team member and a great one, or for that matter a good leader or a great one. I’ve come to the conclusion that Attitude is a key defining factor. Who are the stars in your organisation? What characteristics do they possess that make them your top choice? Generally, the best employee is the one who exhibits desired behaviours, i.e. attitude, in addition to having a strong skill set in what’s needed for the job. What constitutes a ‘great’ attitude? What attitudes make a STAR PERFORMER? The person with self-belief believes in his or her abilities and strides forward with the expectation of success. Others can see and feel that confidence. They are not arrogant – they don’t have to be. Being self-assured means you are secure in your own specific abilities and are happy to let others shine in their own ways. Confident people are not overly sensitive and don’t have big egos. Those who are truly self-assured are the ones you feel good being around. It is often not always the strongest, nor brightest that succeed. Sometimes it is the one who simply refuses to give in – who fights against every discouragement, who presses through every difficulty, who ignores every prediction of failure, who spares no effort, who sees no problem as insolvable and no obstacle as insurmountable. A person with tenacity simply believes that there is a way even when everyone else thinks there is not! Don’t you find that your highest performers are often the most approachable? They’re always happy to help, even when they’re really busy. You often find that your star performers are also great coaches because their so approachable and are good at what they do. I’ve also discovered that those who are extremely positive don’t resist life’s events, curse their fate or bemoan how bad things always happen to them. Instead, they believe that everything happens for a reason. This approach helps them to overcome setbacks and “go with the flow.” They learn lessons fast and don’t make the same mistakes again. A person with high personal energy has a positive outlook on various situations, even during difficult times, maintaining the perspective that the glass is half full rather than half empty. Their energy tends to motivate others as well as themselves! 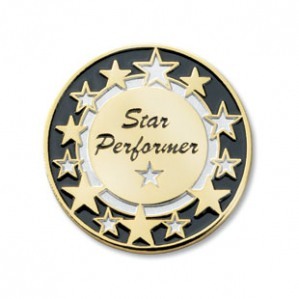 Star Performers go above and beyond the call of duty of their day-to-day tasks. They pay attention to details, seek solutions to problems, and provide a high level of commitment in their duties. In short, they deliver and some, consistently. Anyone that says – ‘That’s not my job’ or says ‘I passed it on to Dave to do, hasn’t he done it?’ or ‘Oh sorry, I forgot’ is not taking responsibility. People that take responsibility, take ownership and take the initiative. If they see something that can be done in a better way, they make it happen; they take decisions; they’re accountable for their actions and they also take responsibility for their own personal development and performance. Star Performers focus on the right things, not only to meet their objectives, but they also focus on doing the ‘right thing’. Star performers are driven by results and stretch targets. See my previous post ~ Focus on Focus. Authenticity and generous listening are great behaviours that are not always prevalent in business. These behaviours do get results and often much more quickly. Great businesses need people who speak up and express their thoughts and ideas clearly, directly, honestly, and with respect for others. Such a team member does not shy away from making a point but makes it in the best way possible — in a positive, confident, and respectful manner. Star Performers deliver. You can count on him or her to deliver good performance all the time, not just some of the time. No matter what the task, a star performer will always perform it without grumbling or with lacklustre, in fact quite the opposite. They’ll absolutely immerse themselves in the task until it’s complete. Star Performers are always respectful of others, even if they have differing views. They generously listen to what others have to say before expressing their viewpoint. They never speak over, or cut off another person. Star performers never insult people, name call, disparage or put down people or their ideas. They treat people the same no matter their status, race, religion, gender, size, age, or country of origin. Know any Star Performers? Take some time to spot individuals demonstrating these attitudes in your organisation. With the right coaching and support, they could be your greatest asset and leaders of the future.